Celebrating Chinese Spring Festival Abroad | WWAM Bam! I used to love the CNY festivities in China, especially those in the mountain village. I’ll will admit that I haven’t done a countryside CNY with the kids though. In 2011, we moved back to the UK and have done our best to track down the spirit of CNY with each year growing increasingly festive. Through friends at the local Chinese weekend school we heard about the Chinese Church group who hold pot luck events throughout the year including one at CNY. I’m not religious myself and many of the Church goers are also there for the social aspect. It has been a very welcoming place and anyone who brings a dish to share at the large buffet meal is able to attend. Dishes from all over China are served and those that taste especially authentic disappear within seconds, with the owner receiving several recipe requests by the end of the night. Later the group will go to the entertainment room where adults and children perform their pre-prepared pieces including music recitals and comedy skits. The evening finishes with some bible study for the adults and Chinese arts and crafts for the children. A more recent event we have joined in has been organised by the local Chinese wives wechat group. They hire out a community centre for another CNY pot luck party. Here the attendees are given tokens that they put under each dish that they thought was especially delicious with prizes given out to the best chef. Each year the winner is often the same person who everyone knows cooks amazing Sichuan food, although don’t forget to keep a glass of water by your side as the volume of hot spice is also incredibly authentic! A programme of games and performances from the children fill the party. Having been in the UK for a few years now, the weekends surrounding CNY are filled with dumpling get togethers at friends’ houses. After dumplings, the children often enjoy a movie while the adults play the Chinese card game dou di zhu/flight the landlord. The rules are complex but can be learnt. The movies used to be watched on massive TVs, each TV seemed larger than the other. Recently many have converted to cinema like projectors. This year we added in two more CNY events into our calendar. 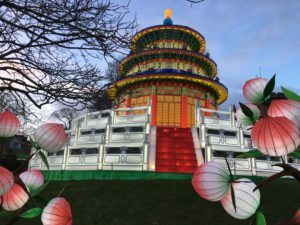 Edinburgh zoo, which is home to giant pandas from Sichuan put on a 50 day nighttime display of 450 beautiful lanterns called the ‘Giant Lanterns of China’. 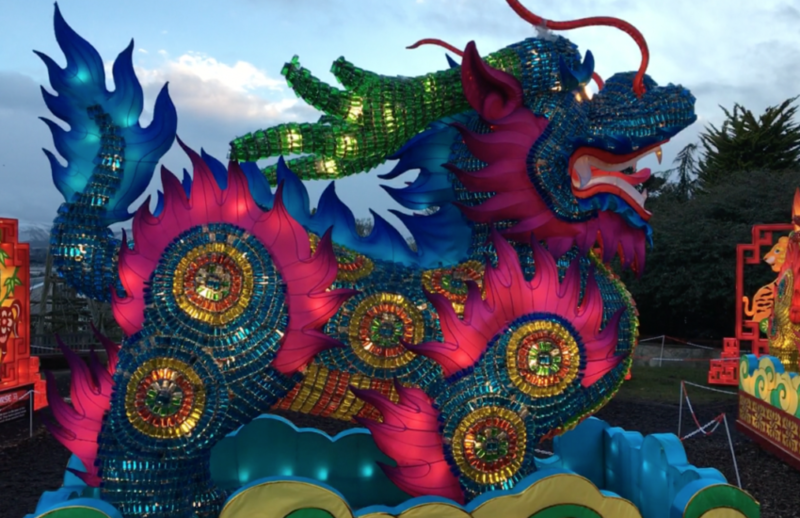 Many from our local Chinese community travelled especially to let their children see the dazzling display. It was the highlight of CNY for our kids this year. Finally, we are lucky to have a very hard working Confucius Institute in our city. They offered a few events over the new year and we attended their afternoon of child friendly crafts. The room was filled around the edges with different craft stations. 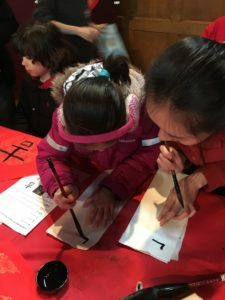 From calligraphy and paper cutting, to traditional Chinese dancing, dumpling making, and the Chinese dress up photo booth, the children were able to get in touch with their Chinese side. Every year the local schools teach the children about Chinese Spring Festival but this year one of my daughter’s said, “mum, my friends said I’m so lucky to have a Chinese dad”. It was a sweet comment but it inspired my daughter to feel that its ok to be different and she is fortunate that in our home we celebrate festivals from both the UK and China. Their excitement and understanding towards the meaning of CNY definitely increased this year. There’s not a large population but the Chinese community here put a lot of effort into their events so its a close community even though we may live in different parts of the city or shire. Therefore, it feels like and may sound like there is a large Chinese population.